Harmanpreet Singh opened the scoring for India followed by Mandeep Singh who doubled the lead to make it 2-0. In reply, only Peillat Gonzalo scored for Argentina and India won the match. 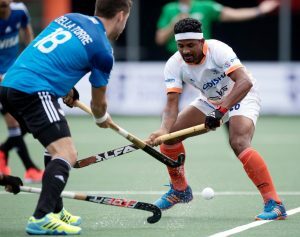 The Indian Men’s Team put on an impressive performance to claim a 2-1 victory against Argentina in their second game of the Rabobank Men’s Hockey Champions Trophy Breda 2018 on 24th June. See here the moments. India’s splendid performance continues in #ChampionsTrophy Hockey … After thrashing Pakistan 4-0 yesterday, India beats Olympic champions Argentina 2-1 today. Indian hockey is slowly but surely gaining its old glory! START watching if you still haven’t! Fifa is fine but this is our own playing people! Argentina jo haal football mein woh he Hockey mein bhi.. India 2-Argentina 1. And WE WON. #INDvARG.